Way back in October 2013, we embarked on a fundraising drive to help keep Bishnu and her siblings in school at least until April 2013 so that she could finish her 12th grade studies. However, when an opportunity arose to raise funds to support the education of younger siblings and/or children of dead migrants, last December, we took it. In January, 2014, seeing as COMMITTED may be able to continue to support Bishnu’s siblings, I paid her family a visit to assess their needs and to get first hand information about their situation. The adventurous five-day trip was a sad reminder of the plight of families in rural Nepal that lose their breadwinner. Following my visit, the principal of the school sent me a letter, as per my request, detailing the cost of educating Bishnu’s siblings. We are very happy to hear that you and your organization will be providing financial support for the education of our students listed below, the children of Dol Bahadur Khadga, who died suddenly Qatar. To begin with, we would like to thank you and your organization for this gesture. 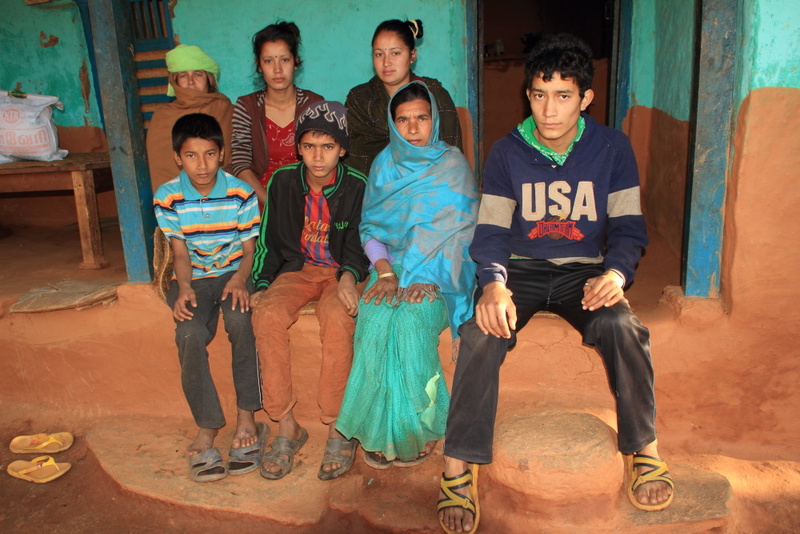 Late Dol Bahadur Khadga has 7 children. The family is very poor. They are also a big family. The children are disciplined, have very good attendance records and are dedicated to their education. Rs. 600/month X 10 months = Rs. 6000. Rs. 300/subject/month X 3 subjects X 4 months = Rs. 3600. Snack and other expenses: Rs. 20/day X 220 days = Rs. 4400. The fifth school-going sibling, Raj Kumar, an 8th grader, attends Shree Bhim Karina School in Karina-5. Luckily for him, the Chairman of the School Management Committee, who happens to be a friend of his late father, has arranged for all his expenses to be covered by the school except for supplies. * With the funds the family received in March to cover the children’s back-to-school expenses, they were able to get uniforms for all. The family was short of Rs. 2000 for the said item. So, the first deposit will be 5,166 + 2000 = Rs. 7166. And then it will be Rs. 5,166 for the remaining 10 months of this academic year, April 2014-April 2015 (B.S. 2071). As mentioned in the last update to Bishnu’s Dream Lives on, funds raised at Sydney is COMMITTED and Art Exhibition in New York City and those donated to the cause by Leigh Newton (US$134.51), a friend and former colleague from my years in Azerbaijan, and Ms. C. Burcaliere (US$100), a traveller, has ensured that COMMITTED will be able to see through the rest of their high school education. Finally, because the first time we raised funds to keep Bishnu in school was due to the emergency nature of the support required, COMMITTED did NOT include our own overhead costs etc. Time, effort and money has gone into the implementation of this sponsorship program. As has already been mentioned earlier or if you have been following Bishnu’s story since then, you know that I myself even visited the family last January to assess their situation etc. From here onwards, COMMITTED will be adding 15% overhead costs to the running and management of this sponsorship program. On behalf of COMMITTED and Bishnu, once again, I would like to thank everyone who has donated so generously–whether it be time and effort or money. Please visit this page for updates. 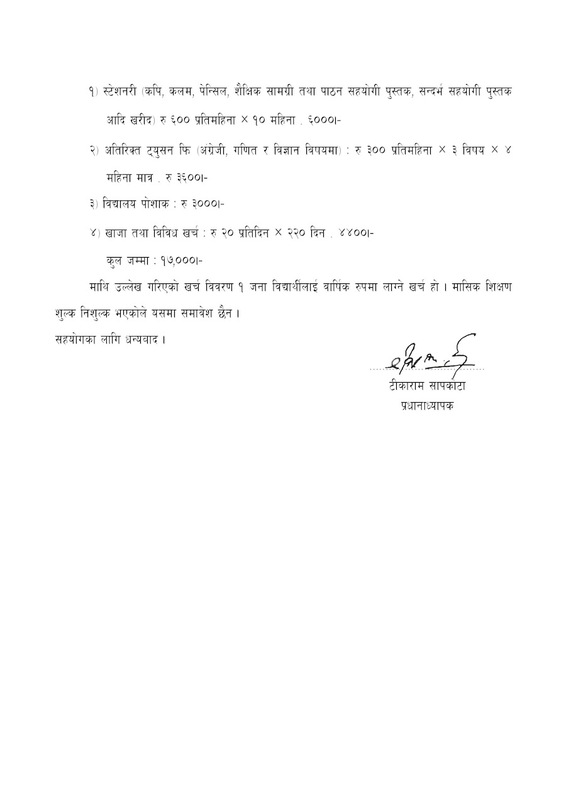 Funds disbursed in the academic year 2071 (2014-15): Rs. 58,826.00. Click here to go to the 2015-16 fund disbursement details.